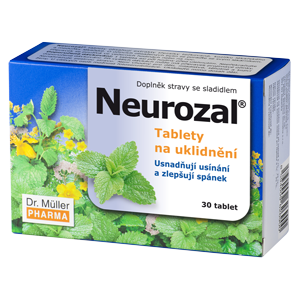 Neurozal products help to fall asleep and improve the sleep. Herbal tea with sedative effect. It helps to fight nervous exhaustion, irritation, anxiety, and tension. The tea is used before going to bed. It can also be used at light forms of trouble sleeping. It can be used in the long term. Adults – 1 to 2 cups daily; children aged 3 to twelve – 1/2 to 1 cup daily. Do not exceed the recommended doses. The product does not substitute varied diet. Not suitable for pregnant women and breast-feeding women. The product may cause photosensitization in sensitive people. Not suitable for children up to the age of 3. Keep out of the sight and reach of children. 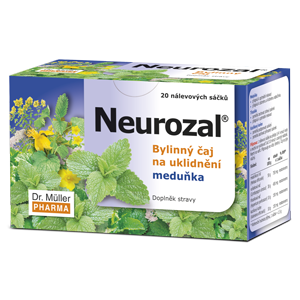 Neurozal® tablets contain the extracts of St. John’s wort, common valerian and common balm. The product is used in the evening of before going to bed. The tablets help to fall asleep and improve the sleep. 1 tablet about half an hour before going to bed. The tablets contain the extracts of St. John’s wort, common valerian and common balm. The product is used in the evening or before going to bed. Do not exceed the recommended doses. The product does not substitute varied diet. Not intended for children, teenagers, pregnant and breast-feeding women. Excessive use can have laxative effect. The product may cause photosensitization in sensitive people. Keep out of the sight and reach of children.